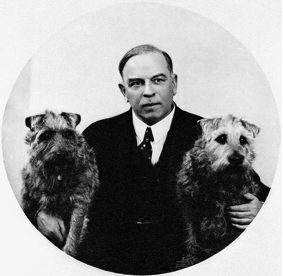 William Lyon MacKenzie King (1874-1950), Canada’s 10th and longest serving Prime Minister was a devoted dog owner in life and in death. King worked long hours and resented social events as a waste of his time, preferring to share his Ovaltine by the fire in the evenings with Pat. King more often than not chose to conduct the nation’s business from home, rather than from his office on Parliament Hill. Pat’s constant presence at King’s side ensured his participation in the process of steadily governing Canada during some of this country’s most turbulent times. We certainly have Pat to thank for doing his part in leading the country as King would analyze the dog’s tail-wagging to determine if the Pat was for or against in government policy decision-making. While active in politics King had an achingly dull public image, which was certainly at odds with the goings-on in his private life. What the Canadian populace wasn’t aware of was his séances, his consultations with spiritual mediums, table-rapping sessions, tea-leaf readings and communing with the spirits of the likes of former PM Wilfrid Laurier, his long-deceased mother, and of course his dear ghost dog, Pat. That he owned and frequently used both a Ouija board and a crystal ball was published in Time Magazine in 1953, news that shocked the nation. Rampant rumours circulated about King’s oddities, some true, most false. That King had Pat stuffed by a taxidermist so that the little dog would always be by his side turned out to be untrue. King’s detailed diary entries, published after his death in 1950 revealed that King consulted the dead Pats during these séance sessions in manners of international political policy, conscription, and Liberal Party Leadership.